The A.R.E. Library (The Association for Research and Enlightenment) in Virginia Beach, is a living memorial to the life and work of Edgar Cayce (1877-1945) who is best known “the father of Holistic medicine”, “the sleeping Prophet” and “the most documented psychic of all time.” My mom, Rose, has told me about him since I was 8! In addition to Cayce’s 14,000 psychic & medical cure readings, the library also houses the largest collections in the fields of metaphysics, parapsychology, comparative religious studies, holistic heath and ancient civilizations. Need Inspiration? Passion? Creativity? A quick boost? Backstory & Vision of Hopeville: Hopeville the City of Light was given to me through a mysterious voice at 4 a.m. one morning. The vision is to get the message of light out to the world. Please help spread the light of this book, through word of mouth, your testimonials, sponsorships to schools, and by giving or donating it to anyone you feel needs comfort or to be uplifted. In these times of little hope, if we could get it into 100,000 hands it can have a ripple effect that could change the world and give people a sense of Hope, creating their own internal Hopeville. I would love for you to be a part of this vision. Synopsis: One night, a little boy, an old man, a widowed mother and a successful business man all pray for the same thing. The power of their individual voices all expressing the same thought reaches the heavens and God decides to send down an angel to answer their prayer in unison. In that one night the town is transformed in the most unusual way. Some people are happy, some are shocked, some are scared, and some don’t even notice the drastic change. For a while everyone is on their best behavior and the town has never been filled with so much kindness. But soon, the evil minded people in town find a way to manipulate this pure gift which angers the angel. The angel decides that people cannot take this gift for granted and everyone is given a special power. Will good win over evil? Will people ever learn that they are put on this earth for only one reason, to enjoy the journey, be happy, live in the moment and learn from their challenges? Hopeville CD is now available! Click here! Unknown to the towns people, they are on the clock and if they don’t all agree on a very simple task, this gift will be taken away from them forever. Can the four people who started this miracle, convince the towns people to change their ways and thus ensure happiness for generations to come? Hopeville is a simple story, told to inspire, motivate, and keep people realizing that they too can create their own miracle, if they only ask for it. YahooNews, Huffington Post, Fox TV, ABC News, Buzz60, CBS-Live it Up! And heard the Charlie Harary Show, WHUD, and numerous other stations around the world. This was a great book. Loved the message. It was so simple yet so deep. It has encouraged me to make my light shine brighter. Must read. Great book! Very inspirational, regardless of what your religion or beliefs might be. Fran Capo has tapped into something very special here. I can’t recommend any higher. Fran has been such an inspiration to me. She is right. This book will come into your life and give you a message that you need. I became a Black Belt at age 48 and and always looking for ways to better myself. This book gave me a certain message I needed at this time. I have passed it on at my TaeKwonDo school. I’m sure it will be required reading soon. When an angel delivers a message to 4 people in the town of Hopeville, their lives are changed forever. A modern-day parable, “Hopeville: The City of Light” is a simple, enchanting story that will appeal to readers young and old alike. This novella is a fine example of how paying it forward can not only change one’s own life, but the lives of those around us. Fran has released, “Hopeville the City of Light”, an e-book on Amazon fired up and ready for Kindle, on your pc, smart phone or tablet. Highly recommended. Follow Fran’s telling of a powerful story using human metaphor, a town divided now must unite and work together to earn a gift more precious than money. Why? I found in this story we all have the power to change our destiny. The challenges we face are with us every day and the paths we take shape the person we are. Relating to others and joining together with the supreme powers within us we can achieve the life long goal of happiness. I passed it on to my sister and asked her what she thought of it. She said the book was very short and in the language that a High School teenager could understand. Fran, I do believe you were chosen as the Angel of Light to write it. God Bless you!! Fran, I have just finished your book, and I can’t tell you in words how much I loved it! I was having one of those days when all goes wrong. Your book made me realize that I can change the person I want to be at any time. I love it and will definitely keep if for a rainy day when I need to refer back to it. Thanks for such an inspirational book. I am ordering 50 copies to sell in our Magic store because I feel it is magical. You and your book can both be described in one word, Awesome, Capital “A” !!! 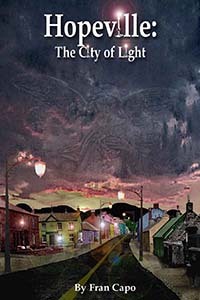 Hopeville: The City of Light candle is a perfect companion piece to a timeless little powerful book of the same name. I want to buy a candle from you Fran Capo! 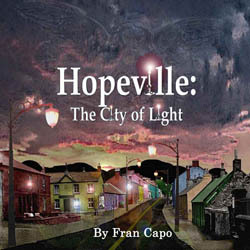 Loved your book “Hopeville: The City of Light by Fran Capo” – I bought two of them – one for me and one for a friend! Read my copy twice! Your book is a quick read with a powerful punch. Your message of hope is timeless and I plan to order more – they are a great “no-brainer feel good” gift for ANYONE and ANYTIME of the year! Hopeville:The City of Light is a great big message set in a sweet little town. Read it and remember who you are. We’re all connected! I thoroughly enjoyed your radio talk show interview on “Real Woman, Real Talk” it was lengthy, but worth every minute of it! Funny thing is, on my autographed copy of “Hopeville; the city of light” book, I never noticed the Angel in the clouds or the candles in the wording of the title, till it was discussed in your interview.. This book is so worthy of sharing with your friends and to keep sharing it. A friend of mine told me when that when I shared it with a friend I should ask them to write a short message in the back pages, about the book, before they returned it, so that messages can be shared over and over again. I had your book for a while, but ironically it was the morning when I came out of the hospital that for some reason the book was just there by my side. I read it then, just at the right moment I needed to hear the message. It brought tears to my eyes. I had to tell you that. Love you Fran and love your message, of Angels, life & love, in your book “Hopeville: The City of Light”. Thank you for being the flashlight for so many..
Dynamo Fran Capo’s new e-book, Hopeville: The City of Light is a simple book with a big message. This parable is the story of four people who transform a small town when an angel of light helps them in the most unusual way. In the same way the book, “Who Moved my Cheese” helped businesses all around the world. Hopeville will uplift and instruct and show you the way to follow your dreams. It’s not just a book…it’s a way of Life!!! We’ve had a lot of celebrities on our show, but after having Fran Capo on talking about her book, Hopeville: The City of Light, we received over 300 emails the next day. A record! We love Fran and will have her back again with her wonderful message of light and hope. I want to congratulate my friend Fran Capo on this simple read for all ages, along with a great, positive message. Each character in this book can see the positive in every situation, just as we all should in our lives. I highly recommend this read to all of you. Great message! Great read! Loved it Fran! Got my copy. This book is a must read! Fran Capo does it again! I’ve just been to Hopeville and I’m never leaving. Just read your marvelous book for the first time–and certainly not the last. Will be starting very soon again. I knew I was attracted to your light…didn’t know it was your candle. I’m a certified Laughter Yoga leader and am looking forward to leading THE LAUGHING WORKOUT in Florida. Fran my compliments to you! This really inspired me even more! I am very spiritual like you and every word definitely went right to the heart! Thank you so much for this. It’s gift and so are you! A very inspiring story that can help uplift anyone who reads or listens to this story. 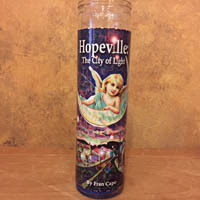 Hopeville gives great insight on bringing positive love and light into our daily life. Fran Capo captures the pure essence of each character in the audio book and brings the listener on a fascinating journey from beginning to end. It was a pleasure working with Fran on the audio version of Hopeville. Fran Capo is an amazing talent and it shines through brightly on Hopeville. Get your book or CD today!! It was meant to be that Fiorellla and I met you at THE Live it Up taping with Donna Drake. We both bought your book that day and I just finished reading it. Magnificent!! It’s an inspirational , meaningful book for all ages and I loved how you ended it with notes and tips from Hopeville. I want my children to read it and of course I bought one to give Thank You for spreading your joy and light with all. I’m so glad that you and Fiorella were there. It was a delight meeting you two at The Live it up taping, and the gift you gave me was delicious and unexpected too. So glad you loved the book and are spreading the word…Thank you! To everyone here who left a comment, I truly appreciate your support and taking the time to write about your experience with my Hopeville book. I believe that this message of inspiration can truly make a difference if people take it to heart. Hopeville reminds people of all ages and all walks of life that hope is a special gift God has bestowed upon us and it is always with us. Thank you for Hopeville! Marilyn and I loved it! It had tones of OG Mandino to me. I went on Barns and Noble and posted this review. Let me know if there is any place else I can post it. The beauty of the Spirit is on every page of ‘Hopeville.’ You will find nourishment for the soul in this easy read packed with positive happy messages. It’s an uplifting joy that will resonate with all your humanity. Enjoy! Hi Fran! I just read Hopeville to and from NYC. I ran in for an audition and knew I bombed it 🙁 I was on no sleep and very upset! I was asking myself if I should keep continuing this and asked for a sign. When I got back on the train, I opened to the chapter that I left off at “The business man” he asked the farmer boy why his light got brighter evetytime he was told no, and the boy said because every NO is going to lead to a YES! I got my sign 🙂 thank you and the book is so inspiring and you were meant to write it! the power of the thought, the good deed, the release and forgiveness…. such great juice in your book… if flowed so wonderfully… who would have thought there is a place next to Waterbury with the name Hopeville? The book which I received by JTC EX-CHANGE Was Really Great and I really liked that the truth of the 4 main characters in the book showed that with prayers all things are possible. Also the 44 lessons of hopeville are still being used in the lifes around the world in people like Eric Wilson and Fran Capo. I would definitely recommend other’s to read this book front to back.Thank you for helping to realize i to can reach my dreams. And also l like the way the book touched my heart and my mother is also is in the possess of reading this book and know as part of JTC KNOW THAT JTC IS ON THE MOVE.